Quiet location, close to the A6 freeway to downtown. Covered parking for free. The hotel staff and service are great and always very helpful. Comfortable hotel just outside Madrid with friendly staff and a decent breakfast. Huge room, easy to reach by car, free parking down the building. Very good place. Nice and comfortable room. Very polite staff. In general great option! it is very quiet and clean, you can get very fast in the city and the staff is very friendly. Good value for money. they let us park for free. Good location just a couple of minutes driving from La Rozas village. Quiet and safe area. Nice surprise, beautiful, well maintained hotel. Lot of parking space. Comfortable, clean room. Great staff! We've got an upgrade to the room with a kitchen at our request - was quite useful in our case. Good, spacious room. You got value for your money. Good underground parking. Even if your vehicle is too high for the gate - there is space outside of the building. Easy to find. Lock in a great price for TH Las Rozas – rated 8 by recent guests! TH Las Rozas This rating is a reflection of how the property compares to the industry standard when it comes to price, facilities and services available. It's based on a self-evaluation by the property. Use this rating to help choose your stay! 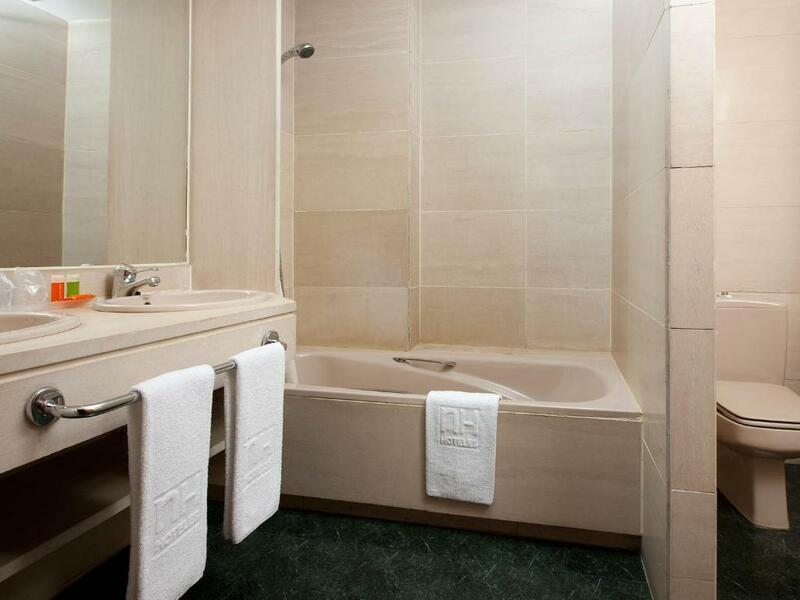 TH Las Rozas is near the A-6 Motorway, with easy access to Madrid Barajas Airport and Escorial Monastery. 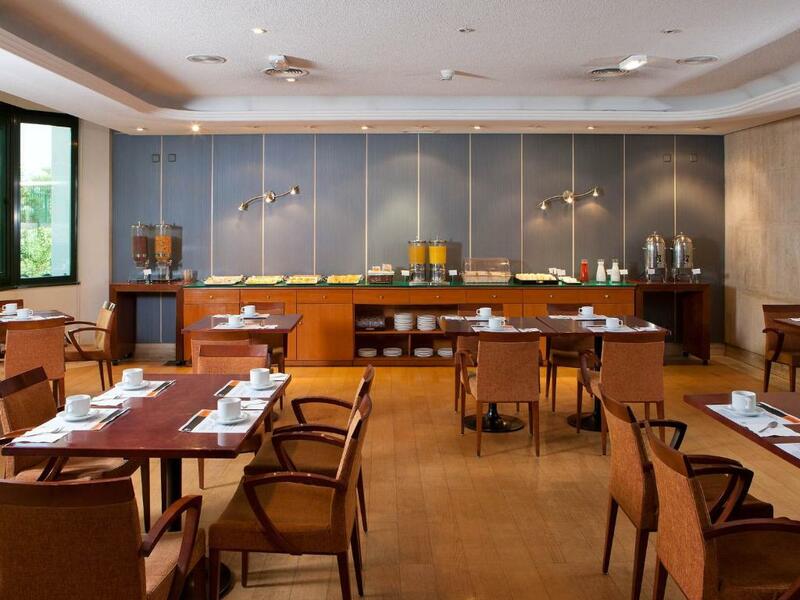 It offers a buffet breakfast and free WiFi. Las Rozas Village is 4.3 mi away. 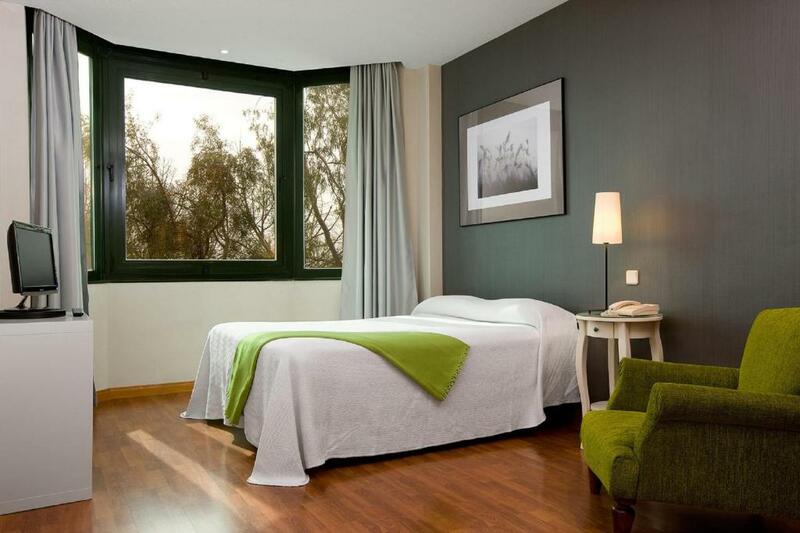 Each room at TH Las Rozas has full air conditioning, heating and satellite TV. They also have a work desk, seating area and an elegant bathroom. The property is surrounded by green areas and is located 8.1 mi from the Torrelodones Casino. Factory Las Rozas and Plaza Norte Shopping are both a 10-minute drive away. The Puerta de Hierro Hospital is 4.7 mi from TH Las Rozas, and Nebrija University is 11 mi away. Madrid City Center is 11 mi from the property. 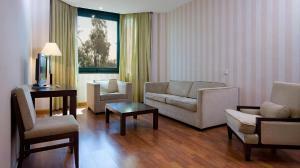 TH Las Rozas offers 24-hour reception. There are also vending machines. This accommodations is located 10 minutes' drive from the Spanish National Football Team's Museum, as well as 15 to 20 minutes' drive from Santiago Bernabeu and Vicente Calderón Football Stadiums. This property is also rated for the best value in Las Rozas de Madrid! Guests are getting more for their money when compared to other properties in this city. 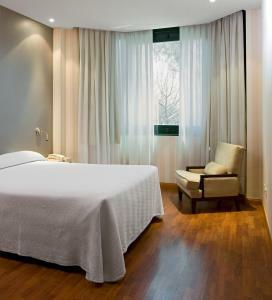 When would you like to stay at TH Las Rozas? 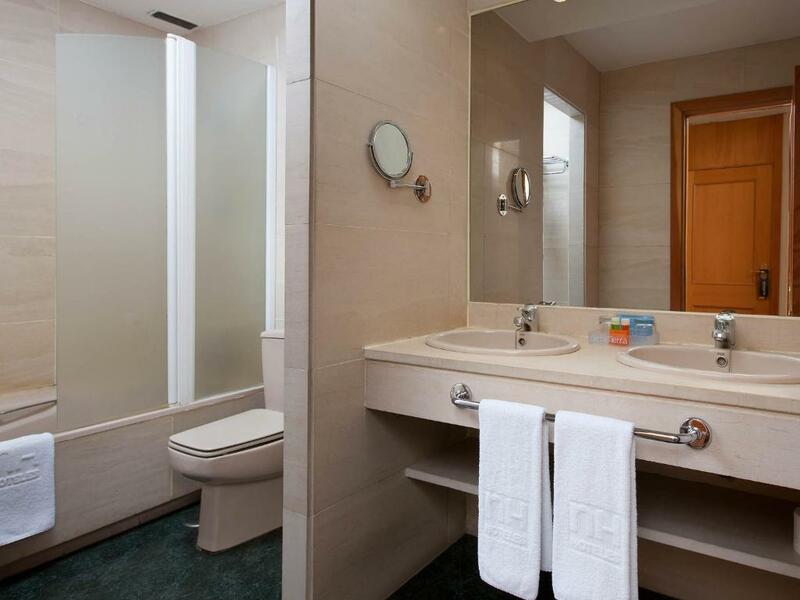 This air-conditioned room features free Wi-Fi, flat-screen satellite TV and a private bathroom with a hairdryer. Extra beds are not available in studios. Private parking is available on site (reservation is not needed) and costs EUR 6.60 per day. This air-conditioned room features a double or twin bedroom and a lounge with satellite TV. There is a kitchen with a fridge and a private bathroom with a hairdryer. Extra beds are not available in the apartment. This air-conditioned room features free Wi-Fi and satellite TV. It also has a work desk and an elegant bathroom. The kitchenette includes a hob, fridge and kitchenware. House Rules TH Las Rozas takes special requests – add in the next step! TH Las Rozas accepts these cards and reserves the right to temporarily hold an amount prior to arrival. Please note breakfast has a EUR 6 extra charge. For reservations of 6 nights or more, full payment must be made upon check-in. Breakfast is a bit weak... Isn't worth to take one, if you have room with your own kitchen. Close to the outlet, but little bit far from the airport - don't trust navigation software, but consider traffic jams in the daytime. Breakfast is ok & also lunch in the evening considering very interesting price is ok.
Had an apartment with kitchen and washing machine. Bathroom with dual sinks, which I like. And quiet. Breakfast was a bit poor if i'm honest, but hey..
No minibar or water bottles provided daily. Pillows not as flat and soft as I like. Locstion is a little bit far. But not a big problem. Location in the middle of nowhere almost like an industrial area. Very good hotel but really in the middle of nowhere, need a car to get to even a local cafe. 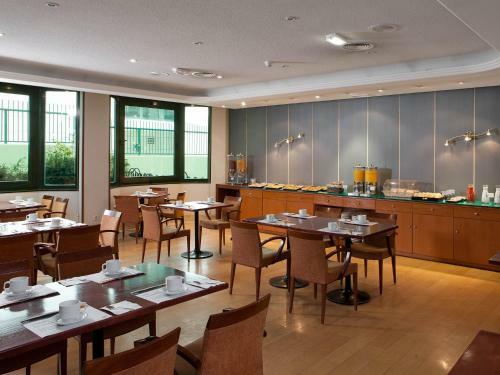 The room was good and clean and the staff very helpful, a good breakfast and fresh, Internet was excellent. Room very simple: missing power sockets for PC and smartphone, no place to open luggage or to hang the coat. Friendly and helpful staff. 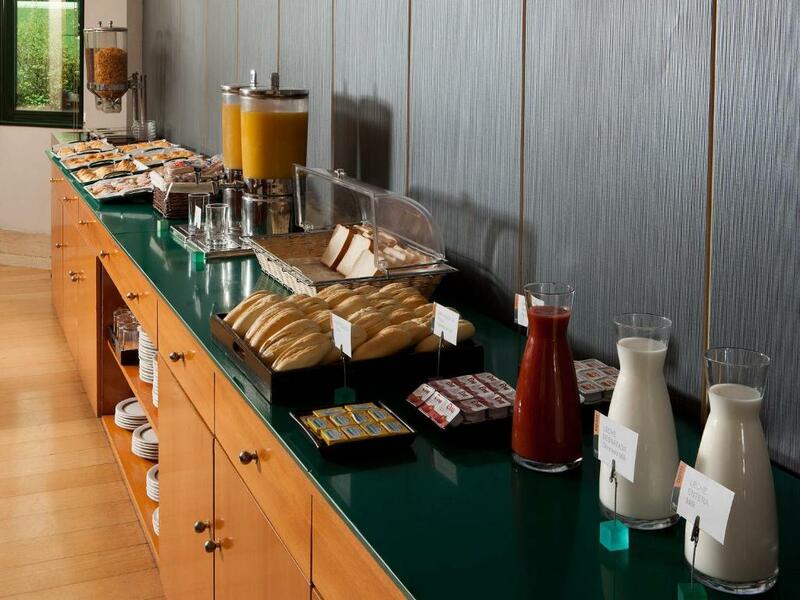 Breakfast OK. Large and clean rooms. Free parking close by.